Carr, R.W., J.E. Coe, E. Forsch, M. Schmelz, D.A. Sandercock, 2015. Structural and functional characterisation of peripheral axons in the caudal nerve of the neonatal pigs: Preliminary data. Proceedings of the 9th EFIC Congress, Vienna, Sept 2-5. The pig tail is innervated by the caudal tail nerves and it is evident at the site of injury after tail docking (i.e. 8/9th caudal vertebrae) that a relatively high proportion of both C and A-fibres can be affected following peripheral nerve transection, with implications for axonal excitability and nociceptive processing in the tail stump. 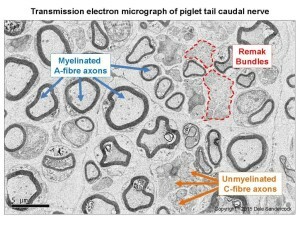 As a proof of principle, it is possible to assess A- and C-fibre axonal function using electrical axonal excitability techniques for pig caudal tail nerve. 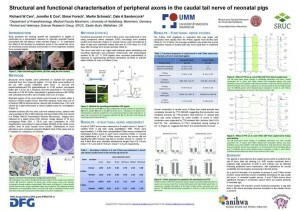 In neonatal caudal nerves, A and C-fibre axons show significant changes in conduction speed which are related primarily to neonatal age. Future studies will examine axonal functional properties in pig tails later in life where traumatic neuroma formation in the caudal nerves is present. Background and aims: Early postnatal tail docking (amputation of 2/3rds of the tail) in piglets is performed as a preventative measure to minimize potential trauma associated with tail biting in older animals. 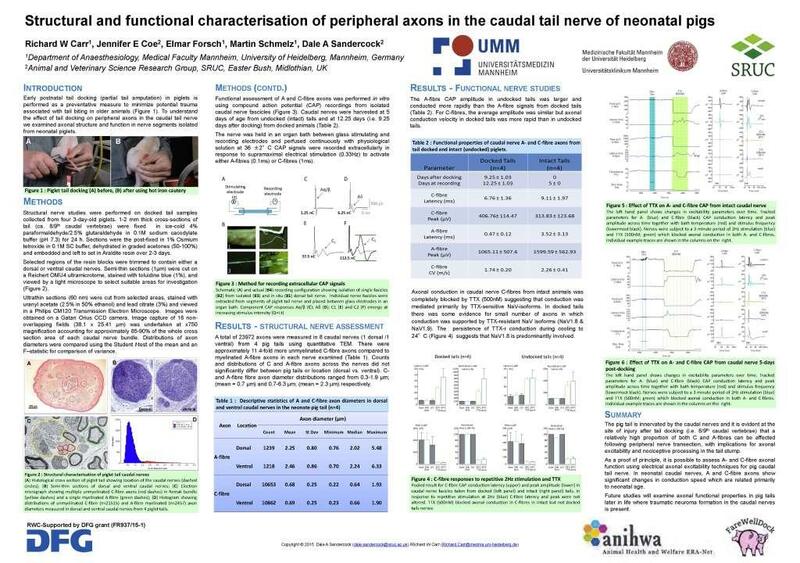 The aim of this study was to investigate caudal nerve axonal composition and the effects of tail docking on axonal function in neonatal pigs. Methods: Axonal composition was examined using Transmission Electron Microscopy (TEM). Functional assessment of A and C-fibre axons was performed in vitro using compound action potential (CAP) recordings from isolated nerve fascicles. Results: TEM revealed both myelinated and unmyelinated axons in dorsal and ventral caudal nerves. Myelinated axons ranged in size from small diameter thinly myelinated Aδ-axons to larger diameter Aβ-axons (mean 2.30; range 0.7-6.3 μm). Unmyelinated C-fibre axons clustered together in multiple Remak bundles (mean 0.7; range 0.3-1.9 μm). Caudal nerves were harvested for functional assessment at 5 days of age from undocked tails and at 12.3 days (i.e. 9.3 days after docking) from docked pigs. The average A-fibre CAP amplitude from undocked tails was larger (1599.6±552.9μV) and conducted more rapidly (9.79±2.04m/s) than the A-fibres from docked tails (amplitude 1065.1±507.6μV and c.v.=7.78±2.57m/s). For C-fibres, the average axonal conduction velocity in docked tails was slower (1.74±0.2m/s) than in undocked tails (2.26±0.41m/s). Axonal conduction in caudal nerve C-fibres from both intact and docked animals was completely blocked by 500 nM tetrodotoxin (TTX) suggesting conduction was mediated primarily by TTX-sensitive NaV-isoforms. 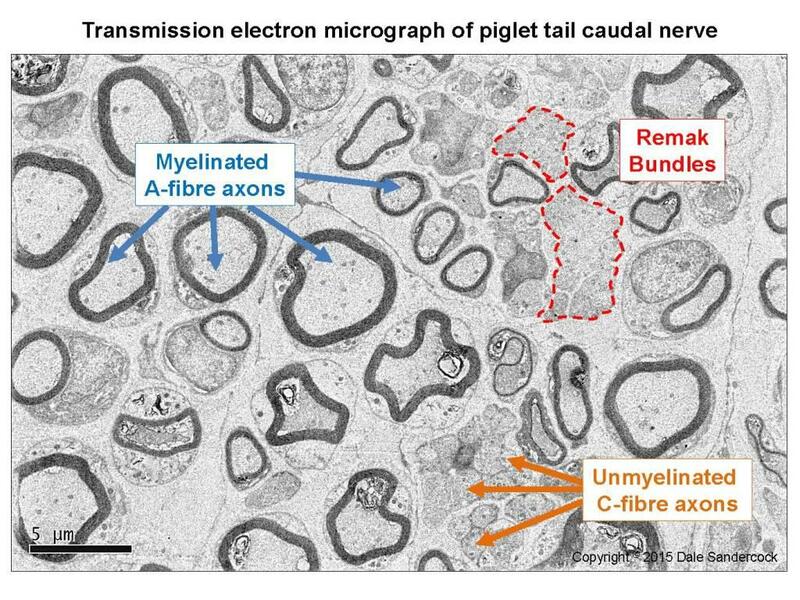 Conclusions: As a proof of principle study, it is possible to functionally assess A- and C-fibre axons in pig caudal nerve using electrical axonal excitability techniques. Di Gininiani P, Stausholm JS, Viitasaari E, Petersen LJ, Herskin MS 2015. 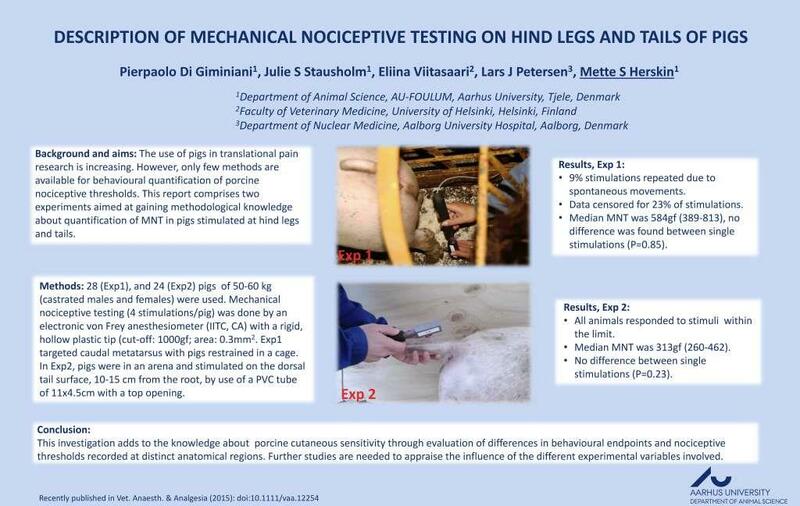 Description of mechanical nociceptive testing on hind legs and tails of pigs. Abstract 1054, Proceedings of the 9th EFIC Congress, Vienna, Sept 2-5. 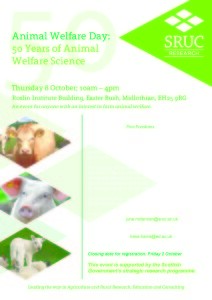 SRUC organises the 2nd Animal Welfare Day. 2015 marks 50 years since the publication of the report of the Brambell Commission which really began the scientific investigation of animal welfare, and laid the foundations for the Five Freedoms. SRUC marks this anniversary with talks, demonstrations and discussions around the theme of the Five Freedoms, incl. the hosting of a webinar. The 2nd Animal Welfare Day is held on 8th October 2015 at the Roslin Institute Building, Easter Bush Campus. FareWellDock partner Dale Sandercock will be using this event to discuss and demonstrate quantitative image analysis (histopathology and TEM) in relation to tail docking in pigs from the FareWellDock project. Entry is free but requires registration (see flyer).